How do I connect microphone audio to spf.io? Q: How do I connect microphone audio to spf.io? A: In order for spf.io to generate live captions of your event, you must connect the microphone audio to the computer running spf.io. Note: we do not recommend using the laptop microphone for a live use case, as it will not capture good sound. Update as of April 5, 2018 – Read this post for a more in-depth article discussing spf.io equipment and microphone setup. A common setup is to connect a 3.5 mm male-to-male stereo cable from the soundboard directly to the computer’s microphone input. Work with your venue’s A/V tech team for this connection, your venue may have alternative setups to consider. The important point is to get microphone audio into a 3.5 mm cable to connect into the computer’s microphone input jack. 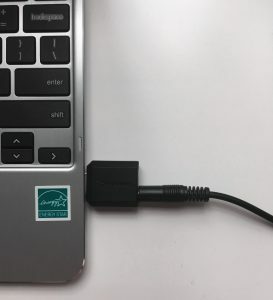 If your computer does not have a dedicated microphone input jack, you will need a USB converter* to accept microphone audio. * Disclaimer: TheoTech may earn a small commission if you purchase this item via the provided link.